A look from above as Celtics players pose for photos on Media Day.WALTHAM, Mass. -- Boston Celtics coach Brad Stevens sat at the podium that all of his players would eventually shuttle through and dutifully fielded questions for 12 minutes on Monday as part of the team's media day festivities. At one point, Stevens noted, "A lot of my answers might be long-winded today, but to be quite frank, I’ve got a bunch of practices on my mind and that’s kind of what I live for." Yes, media day is a circus and, for coaches, a bit of a nuisance. Celtics staffers patiently herded uniform-clad players through a series of stations that included three different photo-ops, video promotions, TV and radio interviews with affiliated outlets, and a stop for a Q&A with a throng of reporters (who were just as question fatigued as the players by the end of the three-hour session). 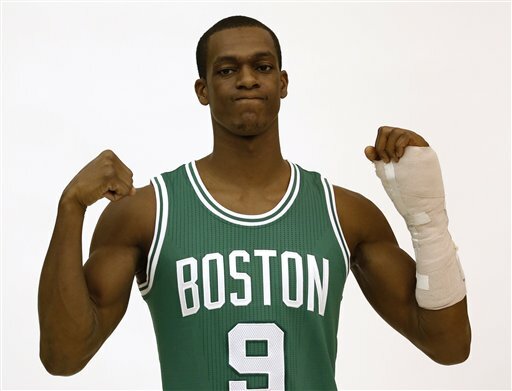 Rajon Rondo's cast on display during a photo shoot at media day.• Rondo: 'Am I under investigation?' Wearing an oversized black sling, Rajon Rondo playfully brushed off speculation about the cause of his broken left hand and stressed that he is remaining positive despite the setback that will sideline him for the start of the 2014-15 season. Rondo, as expected, was the focal point of the day and, with Celtics president of basketball operations Danny Ainge alongside, did a nice job fielding inquiries about his freak injury. Read a full recap HERE. Rondo also reaffirmed a desire to remain in Boston long term, while noting, "The love you get is kind of overwhelming in Boston. Why wouldn’t I want to stay here?" • You get an opportunity! And you get an opportunity! And you... : With Rondo sidelined for as much as 10 weeks with his broken hand, one of the main storylines Monday focused on who would replace his presence at point guard to start the season. "It’s an opportunity for Marcus [Smart]. It’s an opportunity for Phil Pressey. It's an opportunity for Evan Turner. It’s an opportunity for all those guys," Stevens said. The Celtics seem content to audition all bodies and hope that someone steps up. And Stevens thinks there's an opportunity for anyone on the roster, regardless of position. "We’ve got 14 guys that can win a starting role," he said. • Could Smart start as rookie? Smart has earned rave reviews since the Celtics picked him at No. 6 in June's draft. While Stevens said he'd have no problem starting Smart if he earns the gig, Ainge cautioned against putting too much on his plate too early. "Rondo is well advanced in his experience; it would be like Peyton Manning versus a rookie quarterback," Ainge said. The Celtics will throw a shortened playbook at Smart, but Stevens has been impressed at his talents and makeup so far. "Marcus is going to get plenty of opportunities, on and off the ball," Stevens said. "I think that he is physically, mentally and emotionally ready for those. He doesn’t have any experience yet, but that will come quick. At the same time, we have other guys and it’ll be great for him to compete for that." For his part, Smart said, "I think anybody embraces the opportunity to play more, regardless if [Rondo] was here or he wasn’t. Just as if he was, I’d still have to earn my stripes. Regardless if he’s here or not, I’m still going to work hard and earn the respect of these guys." • Team check-up: Stevens said that, aside from Rondo, only Joel Anthony (mild groin strain) would be sidelined for the start of camp. The team will tread cautiously with veteran Gerald Wallace and second-year center Vitor Faverani, both of whom underwent surgery earlier this year to repair torn meniscuses. Wallace also had some bone spurs cleaned up in his ankles. • The clock says it all: For recent events, the Celtics have often set the game clocks in their practice gym to "18:18" a reminder that the team is seeking Banner 18. For media day, the clocks were more of a season calendar, reading "20:15." Stevens said, "I think if you wrote down the teams that you think are the contenders in the NBA right now, you may not write us on there. I think it would be fair to say that a lot of people feel that way. So to make up ground, you have to be great at the little things. You have to be great at being a team, you have to look at it through a different lens than -- you don’t have an All-Star here, an All-Star here, an All-Star here. You have to look at it as, ‘What can we all do to shore up our strengths and be the best that we can be.’ And that’s on [the coaching staff] to continue to convey that message." Rookies James Young and Marcus Smart have fun at media day.• Who wants to step up? : The top storyline for Stevens as the team preps for two-a-day sessions and the start of training camp on Tuesday: Who steps up? Said Stevens: "The key question for me is, ‘Who really separates themselves’ not only as the best players, but the best groups. I think we’ve added very solid good players at a number of positions when I look at a Tyler Zeller, Marcus Thornton, Evan Turner and the young guys that we’ve added. I think we’ve added some guys that can really help, but we can very much focus on what do they do well and how do we put them in position to succeed. And really accentuate that when they are on the floor. ... I think that’s where we’ve got to figure out who the best guys are playing together to make our team the best we can play. That’s my big picture view right now." • Powe joins the front office: Leon Powe, whose balky knees shortened his NBA career, but not before winning a championship with the Celtics in 2008, has joined the team's staff in a player development role. The 30-year-old Powe, a key bench player during Boston's title season, said the idea of joining the team blossomed after representing the Celtics at a tribute to Boston Marathon bombing survivors in April. The jovial Powe is eager to start learning more about Boston's personnel and trying to help the youngest players expand their games. 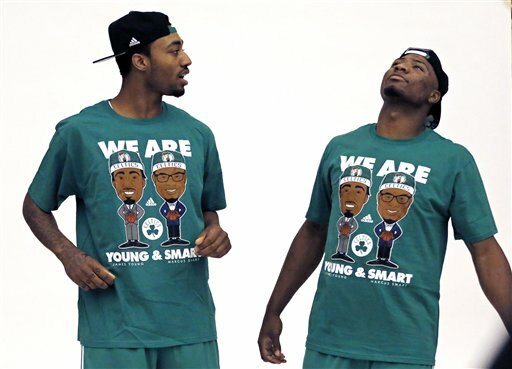 • Young and Smart and Fun: James Young and Marcus Smart, whose personalities shined during the league's rookie symposium last month in New York, again made media day their playhouse. At one point, the two donned the team's "Young and Smart" T-shirts and posed for pictures while dancing and singing. Young evidently doesn't want to miss any of the NBA fun. When asked by reporters during his Q&A about whether he desires to spend time in the D-League, the 19-year-old honestly offered, "Definitely not." He relented that he'd go for game reps and increased playing time if asked, but clearly he's hoping to make an immediate impression that would keep him with the parent club. • Faverani: 'No truth' to arrest: Asked about reports that he was arrested for drunk driving in Spain over the summer, Faverani offered an unexpected response. "There’s no truth," suggested Faverani, who said somebody was trying to "kill" him in the foreign press. "There’s nothing of it," he added while suggesting that his overseas representatives have told Celtics officials that the reports of his arrest were embellished. • Number check-up: Numbers for the team's newest faces: Zeller (44), Turner (11), Thornton (4), Dwight Powell (12) and Erik Murphy (42). Numbers for camp invite: Tim Frazier (55), Rodney McGruder (77) and Christian Watford (27).